Victoria Tilery Cottage, 2.5 kilometres (1½ miles) north-east of Brockenhurst, lies at the end of a track running over the south-eastern corner of Balmer Lawn, close to Standing Hat. Victoria Tilery Cottage acts as a permanent reminder of the Victoria Brick and Tile Works which once operated from this site. The Victoria Brick and Tile Works was built in the mid-19th century by Josiah Parkes, a leading drainage expert. It manufactured tile-pipes used to drain below-the-surface water and deposit it into specially cut, open channels that today still crisscross many New Forest lawns. Until then, sub-surface drainage methods were expensive to implement, and tended to be used only by the wealthy - early pipes were shaped by hand around a drum. But following the invention of a tile-pipe making machine, costs greatly reduced - a £25 machine operated by one man and three boys could apparently produce nearly 11,000 tiles of 1" bore in ten hours! And when low cost tile-pipes became available, they were used extensively. Funds for New Forest drainage at this time were available, at least in part, from the Southampton and Dorchester Railway Company who made a substantial payment in return for access to a route over the Forest - the money was specifically to be used for the joint benefit of Crown and commoners in draining the Forest. So, against a backdrop of Victorian agricultural innovation in the wider countryside, a desire by the Crown to improve drainage and thus timber production, and commoners ever-eager for more and better grazing; the availability of funding and new technology came together and contributed substantially to local landscape changes, particularly around the lawns. It seems likely that Balmer Lawn formed an early pilot for the system, although Parkes certainly had in mind work at Weare's Lawn, west of Brockenhurst – around The Weirs, as it is now known. Obviously not a man to mince his words, Parkes noted that this morass ‘abuts on the skirts of Brockenhurst, rendering the air most insalubrious, and occasioning constant disease.…‘. The new drainage channels, though undoubtedly unsightly when first cut, today appear largely natural, except for their often unerringly straight course. Fringed with aquatic vegetation, albeit often heavily grazed, they support a wide range of wildlife including important populations of dragonflies and damselflies. Victoria Tilery Cottage still shows on modern Ordnance Survey maps, and is actually the Victoria Brick and Tile Works manager’s bungalow, converted to a house. Nothing of the factory remains, but evidence of associated excavations can still be seen, including, visible from the nearby cycle track, a deep, disused pit that on the 1898 Ordnance Survey map is marked as a clay pit - at least some of the raw materials, then, were available on-site. 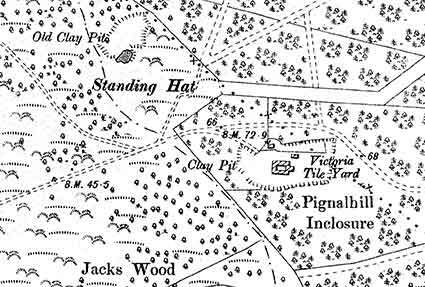 Another pit, described on the map as an ‘Old Clay Pit, is shown 200 metres, or so, away, on the edge of Standing Hat. As is often the way, though, some things have a habit of turning full circle, and in recent years wetland restoration programmes have been undertaken in attempts to restore valuable wildlife habitats.